A social enterprise to improve the health and fitness of schoolchildren has been founded by two Teesside University graduates. The pair received help and support from Teesside Launchpad, the University’s business incubator, and are about to roll out their high-intensity interval training (HIIT) programmes for children and staff members, to schools and young people’s organisations across the Tees Valley. The pair have also been accepted onto the Launchpad FUEL programme which offers Teesside University graduates funding to develop their business. This year, the University awarded funding totalling £37,000 to FUEL businesses. The support offered to Gurmeet and Matty is one of a number of initiatives offered to Teesside students and graduates, which have helped the University rise into the top 40 in the country for graduate prospects, according to the Times and Sunday Times Good University Guide. 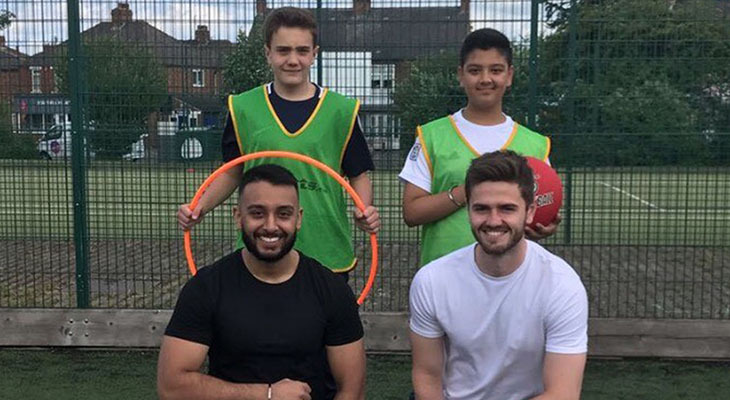 Gurmeet, a BSc (Hons) Food and Nutrition graduate, and Matty, a BSc (Hons) Sports Studies graduate, both undertook a three month work placement with Tees Valley Sport earlier in the year. As part of their placement they helped deliver fitness training to primary school children and teachers and saw the potential for a business which offered structured training and healthy eating advice to both pupils and staff members. Matty said: 'We’re both passionate about fitness and saw that there was a gap for a company which provides high-intensity training to school children. 'There’s a lot of concern at the moment about the fitness levels of young people and training at a high intensity is one of the best ways of keeping fit and losing weight. At Teesside University we feel it is important that entrepreneurship is seen as a valid career path for our graduates. 'As well as the HIIT training, we mix our sessions up with games so that the children are having fun and getting a workout at the same time. Matty and Gurmeet were given advice by Steve Dougan, Head of Graduate Enterprise who runs Teesside Launchpad at Teesside University. Gurmeet said: 'We had no prior experience of running our own business, so to get the support from Launchpad has been immensely useful. 'After talking to Steve, we decided that the social enterprise model was the best way forward for the business. Teesside Launchpad is based in a converted Victorian school at the University’s Middlesbrough campus and offers a co-working space where students, graduates, alumni-entrepreneurs, SMEs and corporate partners can come together in a unique start-up eco-system. Steve Dougan added: 'At Teesside University we feel it is important that entrepreneurship is seen as a valid career path for our graduates. 'We are delighted, therefore, that the skills Matty and Gurmeet have gained during their degree and work placement have inspired them to set up their own social enterprise.